Student volunteers (from left to right) juniors Nick Mastro, Julia DeMotte, and Matthew Tully taking a break from campaigning for Caffrey. Photo courtesy of Facebook page for Jim Caffrey. In the midterm elections this year, Democrats were handed a clear majority in the House of Representatives and the Republicans a larger majority in the Senate. This will mean for the first time since 2014, Congress will be split, with one chamber Democrat and the other Republican. In addition, voters unseated several Republican governors, including our current governor Bruce Rauner. Now that the midterms are mostly over, though, some races have yet to be called, the implications of the election are clear. The majority of local elections were for state representatives and various local referendums. 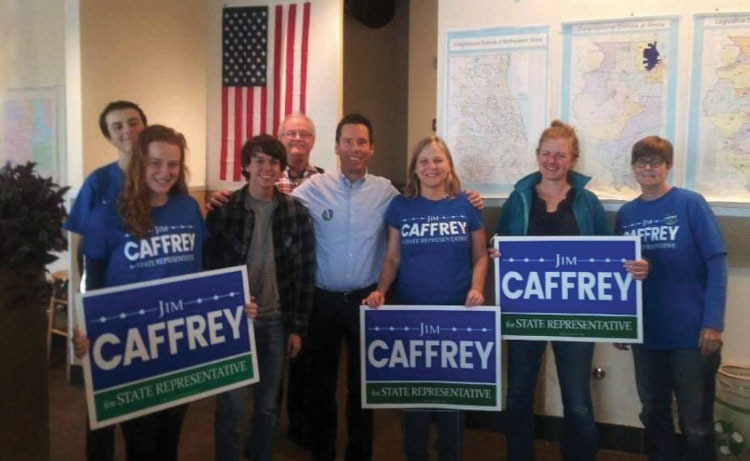 In one of the most predominant state representative elections, Democratic challenger Jim Caffrey lost his bid for the open race in Illinois Legislature District 47 to Republican Deanne Mazzochi. Caffrey’s campaign included many York students who volunteered and got their first experience of a real political campaign. Although Caffrey lost his election, Elmhurst District 205 successfully passed a referendum to update schools in the district. The proposal, a $168.5 million plan, will make several changes to the district. The most significant changes will occur to Lincoln and Field Elementary Schools which will be completely rebuilt. 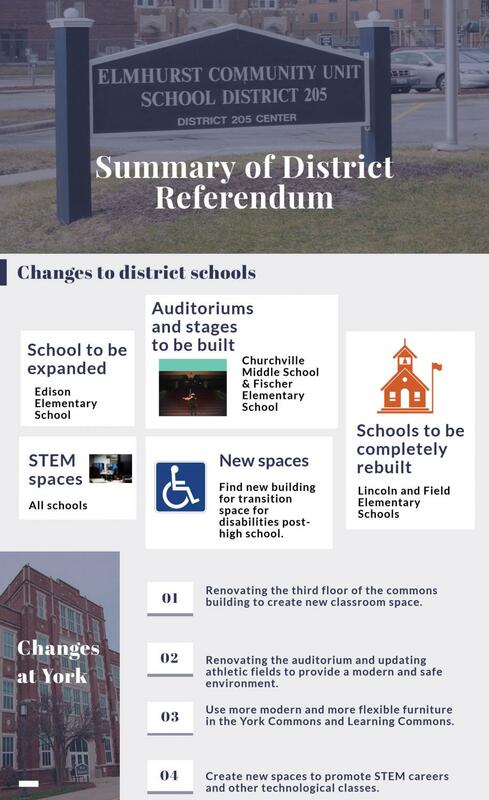 The plan also calls for expanding Edison Elementary School, building auditoriums and stages at Churchville Middle School and Fischer Elementary School, renovating the auditorium at York, and converting the third floor of the C Building at York from storage to classroom space. The changes will not take place in the immediate future but will occur over time, meaning that current students, especially juniors and seniors, at York will be unlikely to experience a significant change from years past. As for the less drastic changes, every school in District 205 will receive new STEM (science, technology, engineering, and math) based areas to promote STEM careers. There were also significant changes at the state level of government. In the state of Illinois, Democratic challenger J.B. Pritzker beat out incumbent Republican governor Bruce Rauner for the governorship. Now, what does this mean for young people? Well, there is a range of implications of Pritzker’s election. One that young people have expressed interest over is the decriminalization of marijuana. Pritzker has called for decriminalizing marijuana and promoting its recreational use. Although the measure has not officially come up in the state legislature, Pritzker campaigned on attempting to pass a bill through the legislature that would make recreational marijuana legal. If the state chose to do so, they would join ten other states and the District of Columbia as states that have legalized recreational marijuana. On the national stage, voters elected a record number of women to Congress including at least 99 in the House of Representatives alone. In addition, voters chose a significant portion of other minority representatives. Voters elected not one, but two Muslim women to Congress, Democrats Rashida Tlaib and Ilhan Omar, along with many other minorities which also make this Congress the most racially diverse. However, there are not expected to be many changes in legislation that becomes law due to the significantly less diverse and Republican-controlled Senate. Therefore, nationally it is likely although this Congress, mainly the House, is far more diverse, typical political logjam will be coupled with a split Congress to prevent efficient lawmaking. Therefore, some say it would be wise to continue to watch legislative processes across the different forms of public government and administration. York students were reminded of this during the Veterans Day Assembly in which World War Two veteran Marvin Sussman gave a powerful speech about political efficacy.